As the days have become shorter, cooler, and many times rainier, it has become very clear that fall is in full swing. I have always been a fan of seasons for many reasons, but the main one is that each season contains rituals and specific routines in life. 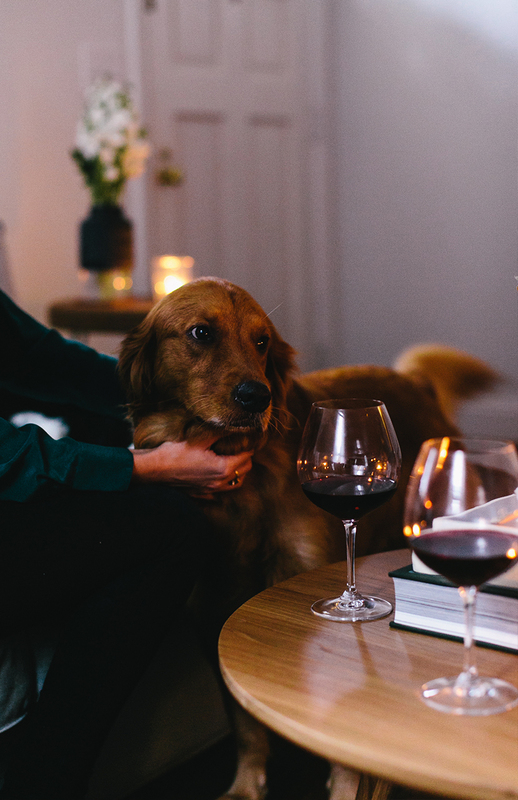 Fall for us has always meant cozy dinners, candlelight meals with friends, great wine, and even better conversation. It seems that after all the long and busy days of summer that fall finds its way of pulling us all back together just in its nature. When we lived in northern Michigan dinner with friends was an important part of the week. 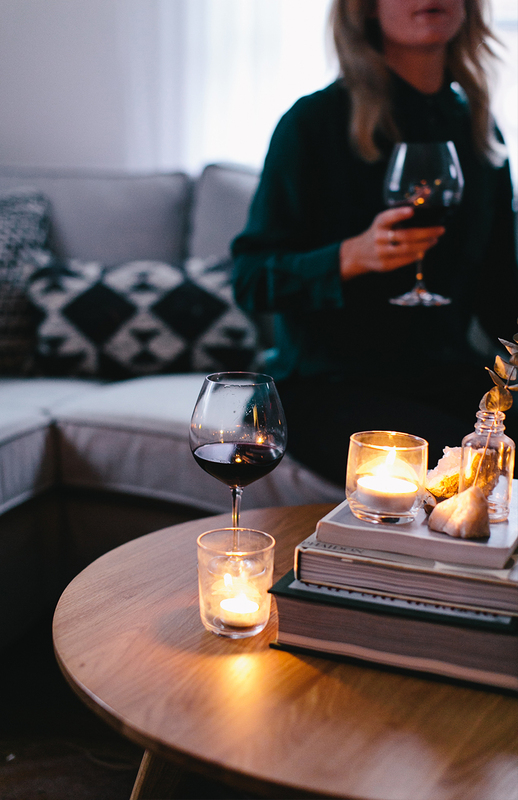 On gloomy and cold days, it gave us something to look forward to, and we always walked away warm all over from the great conversation, good wine, and warm meal. We have found that ritual isn’t much different in Raleigh. We love gathering our friends together for a good meal. It sometimes is only for a few hours especially on a weeknight, but it never fails to bring so much joy to all of us. 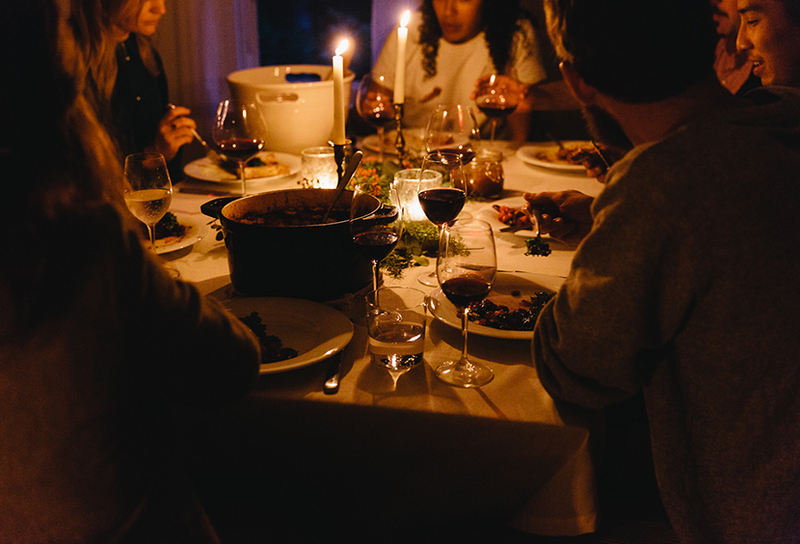 This ritual is such a part of our life that we have partnered with Bota Box wines to share a few recipes you can cook up yourself to create an evening such as this with friends. 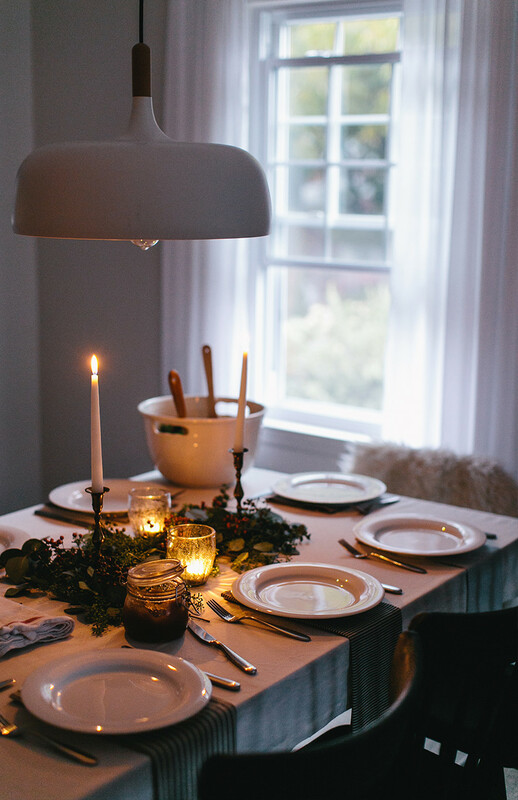 We also are offering up some great tips to make it a little more hassle-free to host a gathering as well. 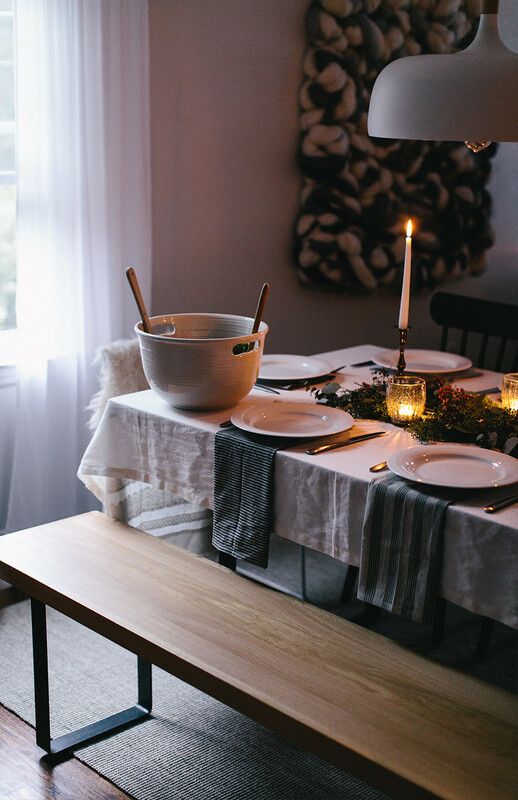 We hope it will inspire you to gather with your friends and feel the warmth of a hearty meal and good company in the way the fall is meant for. 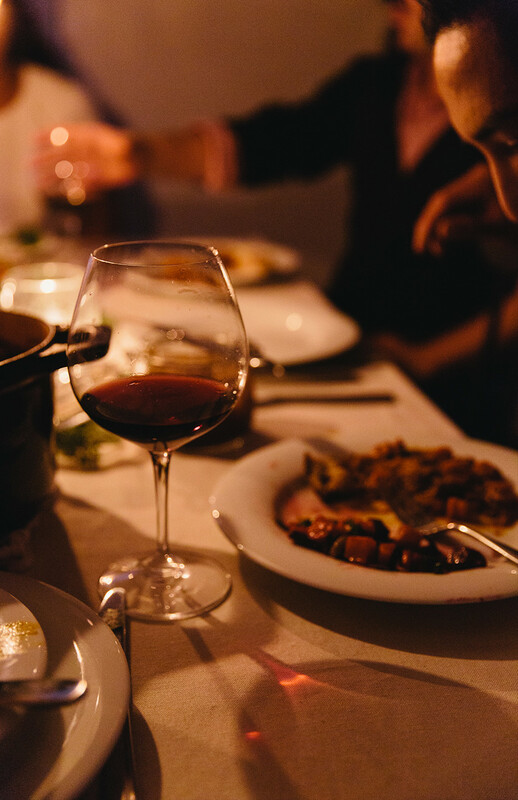 Though I am not drinking right now, we believe no meal is great without plenty of wine to be shared with the table. 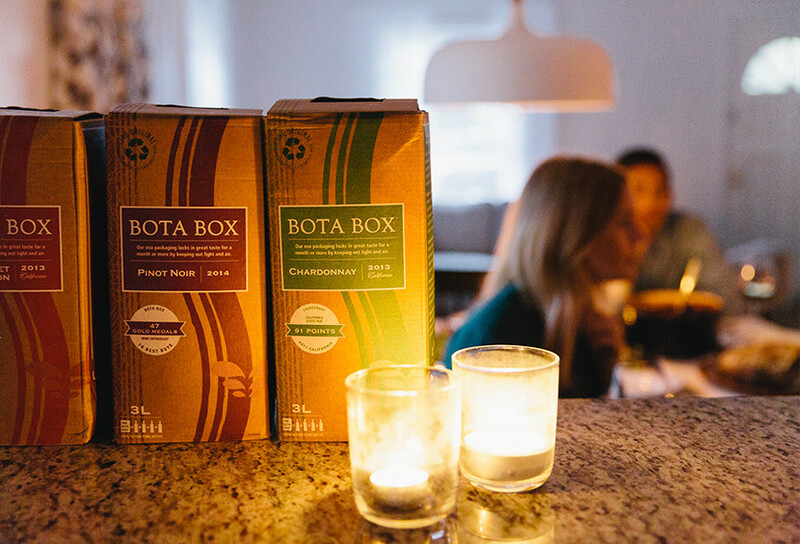 For larger parties, we love pouring Bota Box for our guests. The equivalent of four bottles, there is plenty to go around in one of their 3-liter boxes, and any wine that is left over will stay good for up to 4 weeks. Bota has nearly every varietal you or your guests may want so everyone will have exactly what they are looking for. 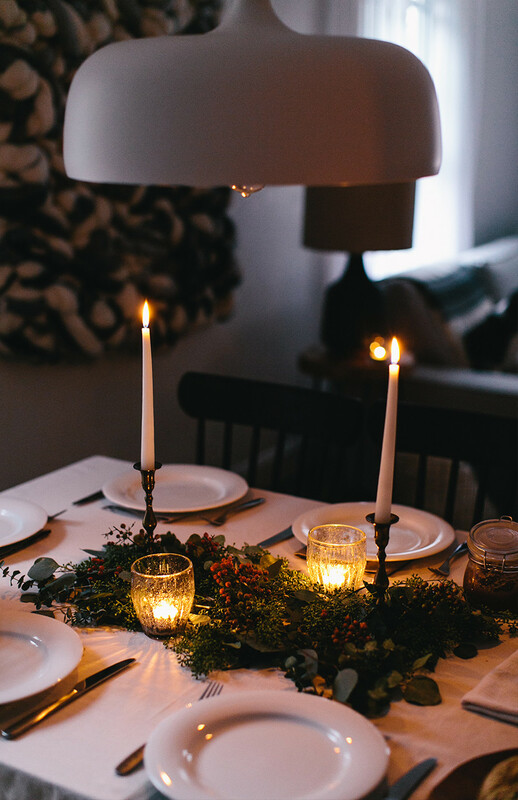 We used a white linen table cloth, gathered napkins in a gray palette, and our everyday white dishware to set the table. 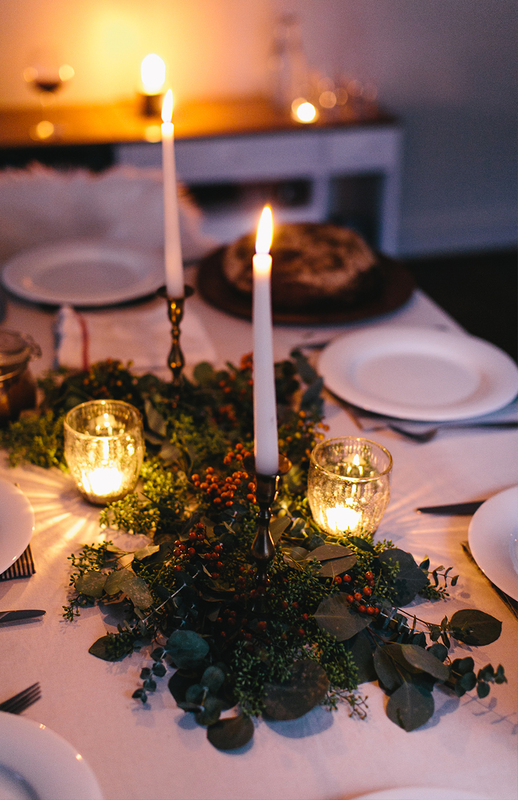 For decor, we used simple candle sticks and two tea lights. The candlestick holders were found years ago at Goodwill for a few dollars and the glassware holding the tea lights was from the sale section at Anthropologie. Most of the time this is plenty enough light for a dinner. I love candlesticks because they are always the mark of a good dinner depending on what is left of them at the end of the night. Finally, I picked up some eucalyptus from Trader Joe’s for $2.99 a bunch and gathered a few sprigs of bittersweet from our yard. It was simple but festive. The best part of it all it cost very little and a lot of it I had on hand. 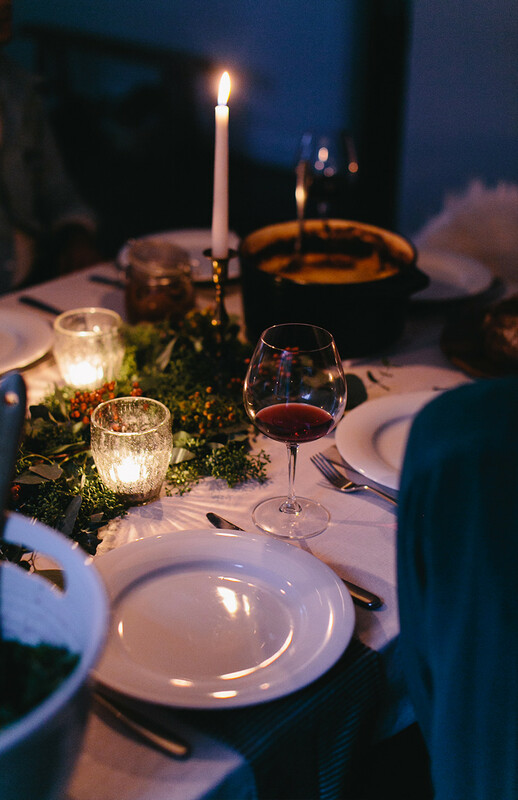 For this meal, I cooked everything since we were shooting, but most times I would offer to make the main dish (the lamb puff pastry stew) and then hand the salad, dessert, and any appetizers over to guests to contribute to the evening. This way everyone has an opportunity to contribute and you aren’t slaving in the kitchen for hours. Though, this meal is simple to prep the day before and to finish just an hour or so before guests arrive in case you want to feel like a rockstar in the kitchen. This is the most important part of a dinner in the fall. The night of our dinner it was raining but still in the 60’s so we left the windows open but made it feel more fall-like by turning all overhead light off and lighting candles all around the main living area of the house. 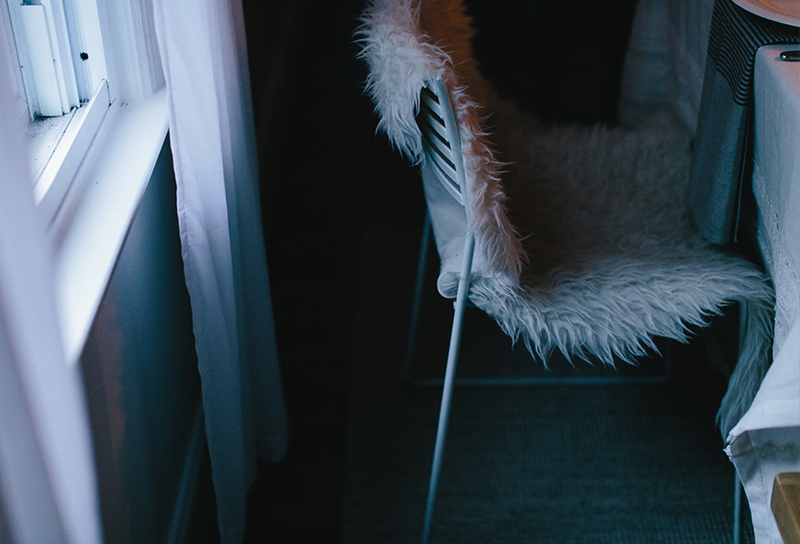 We placed furs on the benches and end chairs to give a cozy touch. 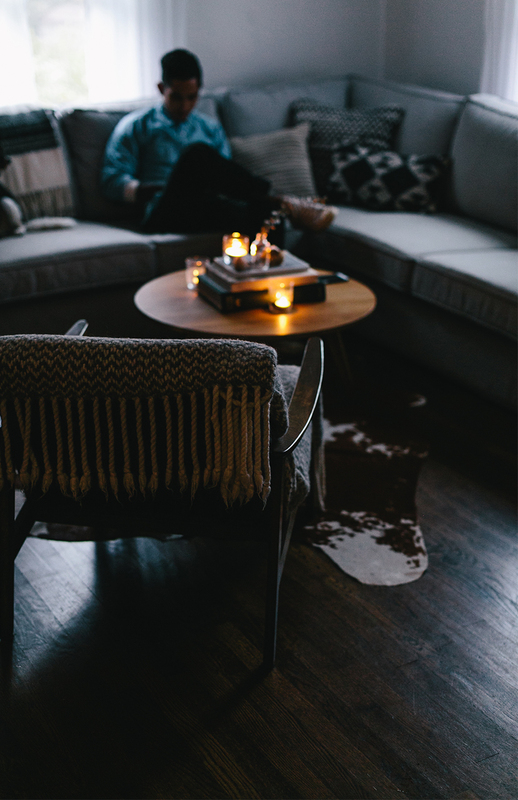 Between the lighting and listening to the rain, it felt perfectly cozy in the house. My favorite part of dinners with friends is cooking. I find such calm in the routine of it. When I am not super busy with work, I love closing the day by cooking dinner in the kitchen. I sometimes will catch up on TV or give my mom a call while I go through the process of cooking a meal. This meal I was most excited about because I have been wanting to try out some of the food we experienced in London since so many of them were traditional dishes I grew up on as a kid. If you want to recreate this same fall meal I have the recipes for you below. 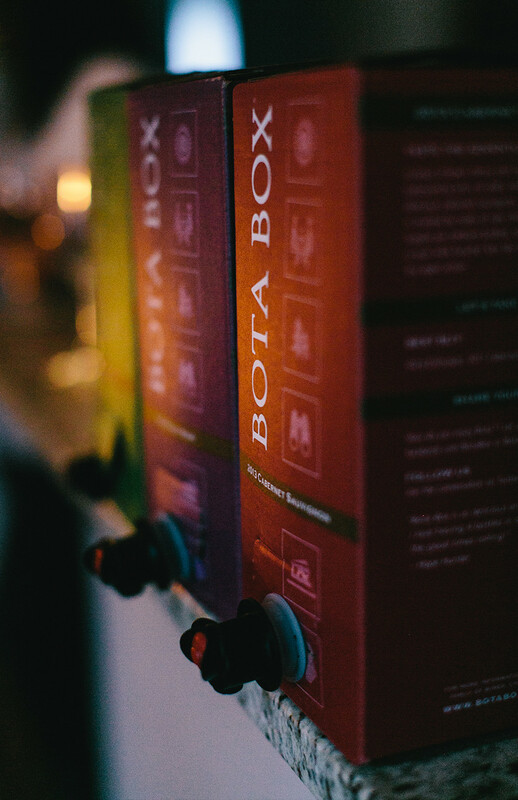 They were a huge hit with our guests and Bota Box has suggested wine pairings if you are looking to do that as well. Place 1 tbsp of Olive Oil in the base of a large pot. Turn the hit to medium/high and drop in half of the chunks of lamb. When they start to brown add in the other half. It should feel pretty full in there, but don’t worry it will start to cook down. Once the meat has started browning add in the full quart of broth. Let the meat cook and cook being boiled in the broth but keep at least a slight covering of liquid on the meat. If it goes down, just keep adding water. The goal is for the meat to be very tender and falling off of the bones. For me, this took about three hours of boiling. While the meat is cooking, chop up your potato, onion, garlic, and carrots and set them aside. Once, the meat is falling off the bone place a large bowl on the counter and then a colander over the top. The goal is you will be draining the broth off of the meat, but you want to reserve the stock…BELIEVE ME! Pour the pot out over the bowl and separate the meat and broth. Allow the meat to cool enough that you can pull out all the bones and any fatty pieces. There should be marrow in the larger bone so clean any of that out you want. I highly suggest doing so. Now the empty pot you cooked the meat in you will be reusing to cook the stew. Place the other tbsp of olive oil in the pot and the onions and garlic. Allow the onions to become translucent. This should take 3-4 minutes. Add in the carrots and potatoes along with the tomato paste and a few hefty pinches of pepper and salt. Then pour in 2 cups of broth. Allow this to start cooking and simmering. Once the potatoes are softening add in the lamb that should be very tender and basically falling apart. Add another cup of broth. Let the stew cook for about 45 minutes on low once it has come to a simmer. Make sure to stir it and add any additional broth that is needed. If you run out of broth, it is okay to add red wine or water, depending on your preference. After 45 minutes turn it off and let it cool for about hour and then cover the pot and place in your refrigerator to sit overnight. The day of the dinner make sure your puff pastry is prepared and thawed if need be. Heat the oven to 375 degrees. 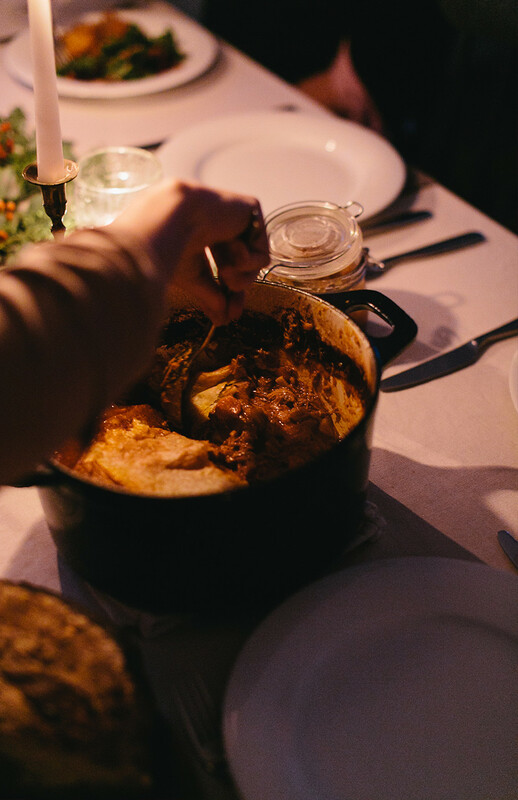 As the oven is warming, pull out the pot of stew and place it on the stove top. I let the stew start warming up some before I put it in the oven. After about 5-8 minutes on the stove, place the puff pastry on top of the stew. At this point, the oven should be ready. Place the pot in the oven and let cook for 30 minutes or until pastry has puffed and is golden brown on top. 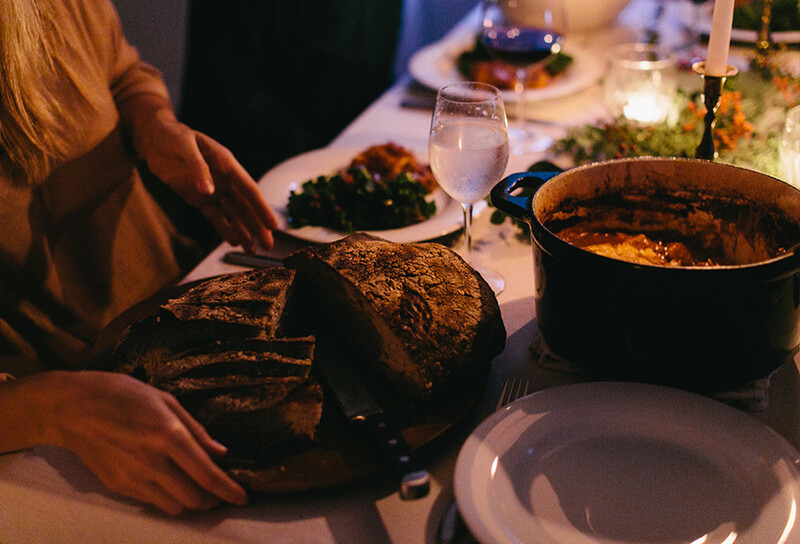 While guests arrive, leave the stew in the oven that you have turned off, and the oven door cracked. 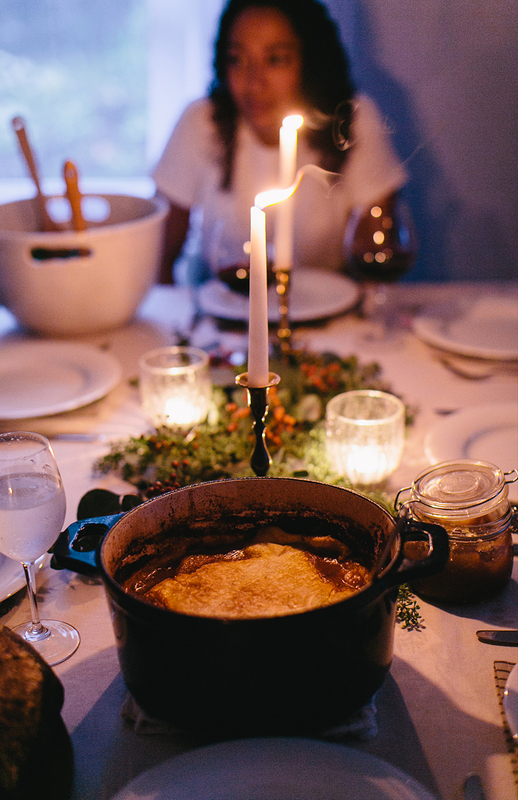 It will keep it perfectly warm while everyone gathers for dinner. Once the squash and beets are both cleaned and chopped place them on separate pans. The squash can be on a pan with no edges. Coat the squash in 1 tbsp of olive oil and a pinch of salt. Repeat the same coating of olive oil for the beets but place them in a pan with edges so you can add 1/2 cup water for them to cook in it will keep them moist. Cook both for 20 minutes. While the beets and squash are cooking, de-stem and wash your kale. Tear it into bite size pieces and place it in the bowl and set aside. While the beets and squash finish cooking, it is best to make the dressing. Place all the dressing ingredients in a blender or food processor. Let blend until thoroughly blended. Taste for flavor and then set aside. Once the beets and squash are done cooking allow them to cool for about 20 minutes. Once room temperature, drop the beets and squash in the bowl with the kale. Add the pumpkin seeds and raisins. Pour the dressing on top and toss the salad so everything is evenly coated. To finish the meal, I made a simple dessert that we collectively decided at the table is the best fall dessert. I made an apple crisp with coconut whipped cream. I love serving desserts that aren’t too decadent at dinner parties because not everyone loves chocolate cake with caramel or lemon custard pie. I love making desserts that fruit based and the option for a little something extra if wanted. Not everyone wants sugar right away after a big meal thus this crisp is a great finishing touch to a filling meal. This makes either one large crisp for a 9×11 pan or two pie pan size crisps. It serves about 10 people. I also cooked these the night before and warmed them up on low in the oven while we ate dinner and made the coconut cream while the stew was warming up just before guests showed up. Before starting the crisp, place the can of Coconut cream in the refrigerator overnight. Make sure it is not tipped or shaken while in their. The goal is to let the fat separate from the liquid. When you place the can in the refrigerator also place the bowl, you will be using for mixing in with it. Wash and peel all the apples. Chop up the apples into thin slices and place them all in a bowl together. Once all the apples are sliced, toss them with 1 tbsp of cinnamon and the place them in your pan or pans you are using the crisp. In the same bowl, the apples were just in, toss in the flour, oats, cinnamon, nutmeg, and brown sugar together. Toss it all together. Melt the butter in either the microwave or on the stove. Once melted, pour over mixture. Continue to toss till the whole mixture seems well coated. Pour the crumble over the top of the apples evenly. At this point, the oven should be heated, and you can cook the crisps in the over for 20-25 minutes. They should be bubbling a little when you pull them out. Finally, to make the coconut cream all you have to do is open the can of coconut cream and scoop out all of the fatty coconut and place in the bowl that has gotten cold overnight. Conserve the liquid for a smoothie the next day. Add in the powder sugar, vanilla, and cinnamon in with the coconut cream. Use a hand mixer on medium to high to whip up the coconut. In about a minute or two it should be fluffy and ready to eat. Serve the crisp hot with a dollop of coconut cream on top. 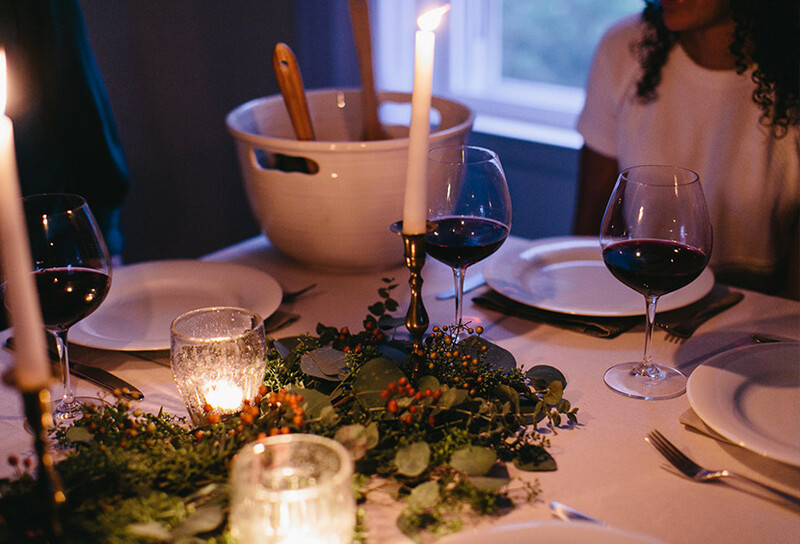 It took me a while to learn the ropes of a dinner party and how to make it something special without it being overwhelming. Coming up with recipes that can be cooked the day before makes it much easier. Thankfully fall lends itself to meals that can be made ahead of time with simple ingredients. 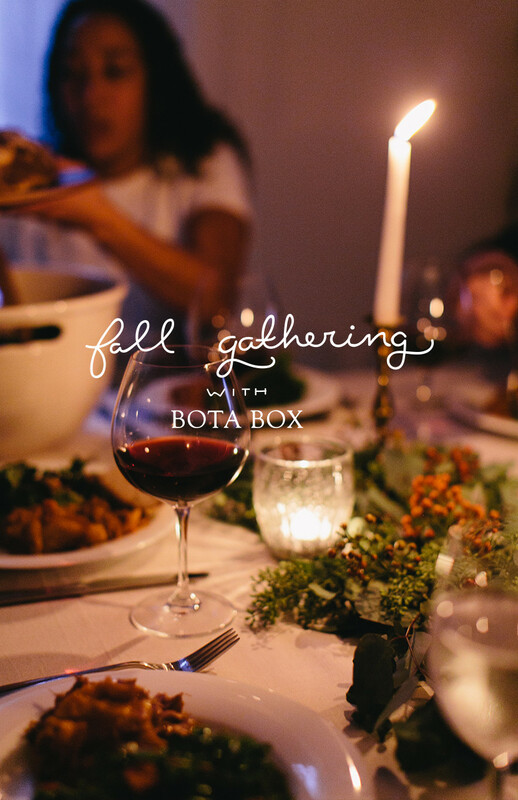 On top of that, being able to use Bota Box wine for guests makes the dinner even easier to put together. 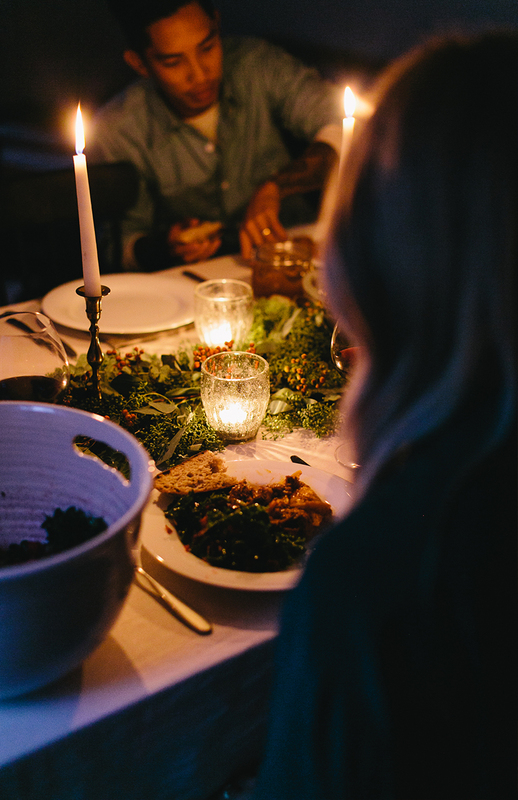 As we enter the holiday season, I hope you find the time to gather with friends and make the time for each other. 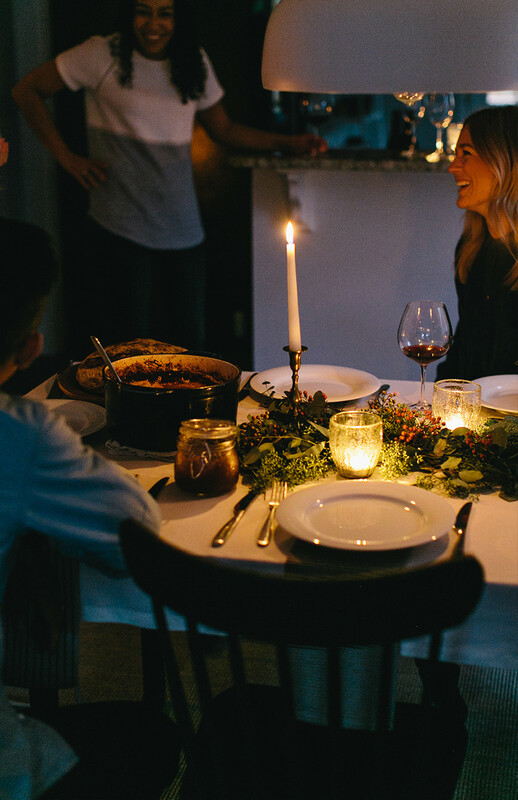 It is easy to find ourselves very busy with the rhythm of the holidays, but my hope is that with these tips and recipes you can come together with neighbors and friends and make the most of this season of gathering with ease. Do you have ways you have learned to make dinner parties special but still hassle-free and fun for guests? What are some go-to dishes you fix that make it even easier but still are crowd pleasers? This post was in partnership with Bota Box. All thoughts and opinions are our own. Thank you for supporting the brands that help us create stories such that we believe in. These photos are exquisite, what a gorgeous evening! The lamb recipe sounds really lovely too, I’ll have to try it out myself! my husband refuses to buy bottles of wine … he’s cheap. but i’ve convinced him that bota box is the only option after he tried to bring home franzia one night … ha! Everything looks very fall! 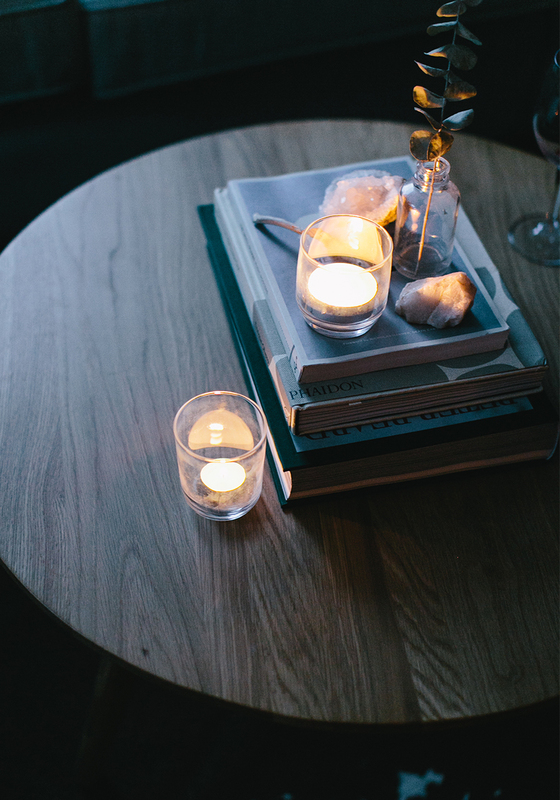 Love that you decided to use candles and went with a meal that sounds perfect for a chilly evening. Go-to dishes for me this time of year are definitely stews or soups of any variety! Always a crowd pleaser, and they’re easier to make than complex recipes. Also, they’re great for leftovers! Hi! I was wondering where you purchased the salad bowl on your table. I am always on the hunt for deep salad dishes and I’d love to snag one if you remember where you got it or one similar. Thanks! I purchased it a long time ago at a local grocery store. I have never ever seen one sense but if I had a store I would had these made because it is hands down my favorite bowl I have.